Tarek Chemaly: Katy Perry is the love child of Syd Brak and Patrick Nagel! 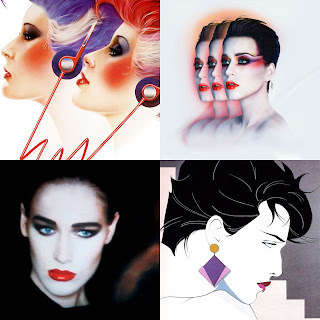 Katy Perry is the love child of Syd Brak and Patrick Nagel! Katy Perry goes all 80s in aesthetics and I love it! Mind you I couldn't spot a Katy Perry tune even if my life depended on it (sorry wrong generation!) but can see the 80s vibes so clearly whenever they are there. If you look closely, this is what happens when 80s ubiquitous illustrators Syd Brak and Patrick Nagel (who did the cover for the Duran Duran "Rio") get a love child. Toss in some Peter Palmer "Addicted to love" glossy lips (and maybe even perhaps some Annie Lennox Eurythmics thing) and you are there. As Raf Simons (who knows a thing or two about aesthetics) said (speaking of Virgil Abloh from the Off-White fame) "It's not always about being new-new because who is new-new?". There you go Katy, sometimes it is not about being new-new.